Nested in central Asia, Kazakhstan is one of the most culturally interesting countries in the world. Blending Middle Eastern, Asian, and Russian cultures, it combines the best elements of the three worlds to create a society unlike any other. Like many parts of the Middle East and Asia, the Kazakh economy is heavily involved in the oil and mining industry. Since Canada has an active oil industry of its own, this makes it a natural partner to Kazakhstan in many of its business endeavors. Indeed, every year hundreds of Canadian businesses look to Kazakhstan to expand their enterprises. Likewise, thousands of Canadian professionals seek employment in Kazakhstan for related industries. Regardless of the purpose, foreign affairs in Kazakhstan will require some manner of documentation. This can include documents such as Certificates of Incorporation, Articles of Incorporation, Board Resolutions, Police Checks, Birth Certificates, Powers of Attorney, or University Degrees and Diplomas. Since the Kazakh government has no way of verifying the legitimacy of these documents in their original forms, there must be a process in place which ensures foreign issued documents are legitimate. The most well-known process of doing this is the apostille process and you may have been told to get a Canadian apostille for Kazakhstan. Although Kazakhstan has signed the Hague apostille convention, Canada has not. As such, Canada uses the original 2-step process that was used by signatories prior to the apostille. This process is known as authentication and legalization and it is recognized internationally as being equal to an apostille. If you have Canadian documents that need to be used in Kazakhstan or just about any other country in the world, you will have to go through this process. Authentication and legalization involves verifying a sequence of signatures. For your Canadian document to be valid for this process, it must contain a signature which can be authenticated or ‘validated’ by an agent at Global Affairs Canada. This can be a signature from a Canadian lawyer, notary public, select members of the RCMP or an official at the Canadian provincial vital statistics offices. Upon seeing this signature, one of the agents at Global Affairs Canada will place his or her stamp, seal, and signature on the document which authenticates it. Note that there are some additional requirements involved as well and they vary slightly between documents. This step can take up to 20 business days for documents they receive by mail or courier and if there is an error on the document it is shipped back and the waiting period starts again. Once this step has been completed, the document is ready to be presented to the consul at the consular section of the embassy of Kazakhstan. The embassy will also request a series of requirements and fees which are subject to change and have their own processing time which can vary substantially. Once these criteria have all been met, the consul legalizes the document by verifying the signature of the agent from Global Affairs Canada and places his or her stamp, seal, and signature on the document. This completes the authentication and legalization process and makes your Canadian document valid for use in Kazakhstan. As you might have noticed, it can take over a month to go through this process. Combined with the likelihood of delays due to error, authentication and legalization becomes very difficult and time consuming. 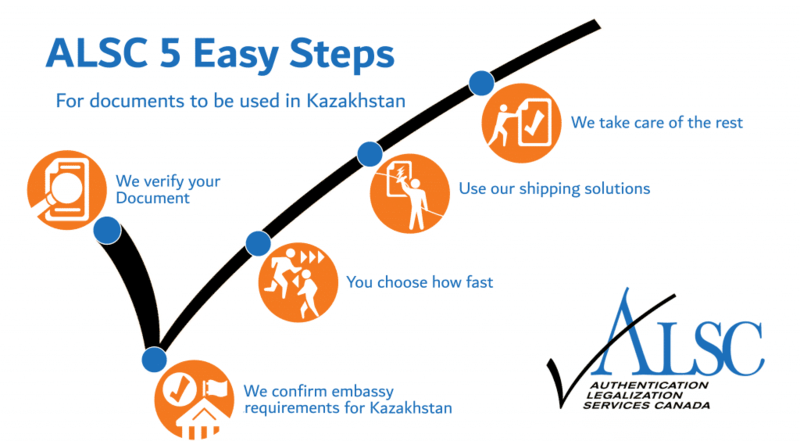 However, there is a way to save up to 20 business days of processing time and ensure your Canadian documents are ready for use in Kazakhstan with minimal delays: trust ALSC. We helped our first client over 25 years ago and since then have helped tens of thousands of Canadian businesses and individuals alike process their Canadian documents for use in Kazakhstan and over 100 countries around the world. Located minutes away from Global Affairs Canada, the Embassy of Kazakhstan and dozens of others, we are the first company to provide this service and have remained its leaders since that time. As mentioned, we can save you up to 20 business days when you choose our priority same business day authentication service. This means that one of our agents presents your documents to Global Affairs Canada on your behalf the same day they arrive in our office. We also offer a standard 3 business day service and economy 10 business day service that may better suit your needs if you are processing many documents. Regardless of the service speed you choose, you save time and can rest easy knowing you are covered by our service guarantee: we ensure your documents will be made valid for use in the foreign country of your choice. Despite not being able to influence the processing time at foreign embassy consulates, the reputation we have built with their staff means that they know we always get it right. This makes us one of their preferred clients and the strong professional relationships we have built allow us to be up to date on all of their changing requirements and fees, sometimes even before they are made public. These are just some of the important benefits that are extended to our clients. As our client you receive professional assistance in preparing your requirements for legalization at the embassy consulate and are provided with detailed updates at every step once we have received your documents. Furthermore, our agents are available at all times during our office hours to personally assist you and answer any questions you may have throughout the process. Once your documents have been made valid for use abroad we can send them anywhere in the world through one of our many trusted shipping partners. If you have Canadian documents that need to be used in Kazakhstan, contact us. We strongly recommend you do so if you are rushing to meet a deadline, as we are your best option in this case. Continue reading to learn more about Canadian documents commonly used in Kazakhstan. Whether you are a Canadian business looking to export your oil products to Kazakhstan, partner with Kazakh corporations, or modify and expand existing subsidiaries, you will need to provide some accompanying documentation. This can include documents such as Corporate Power of Attorney, Certificate of Incorporation, Articles of Incorporation and Articles of Amendment. The exact documents you will need will depend on what your requesting party or affiliate in Kazakhstan has told you. Always make sure to clarify exactly which corporate documents you will need for your purposes overseas. Processing them all at once will save you time and money in the long run. As an existing Canadian corporation, it is likely you already have many of these documents in an accessible location or at least know where and how to have them issued. Another Canadian corporate document that you may need to have authenticated and legalized for use in Kazakhstan is a Canada Revenue Agency Certificate of Canadian Residency for Tax. Also referred to as a CRA Tax Residency Letter or CRA Certificate of Residency, this document reduces and sometimes eliminates taxes on foreign income. It is also commonly used to further prove the legitimacy of your business to authorities in Kazakhstan. If you are looking to get a CRA Certificate of Residency for use in Kazakhstan, you can start by following the steps listed here. Like many other Canadian documents, your Canadian corporate documents will require notarization by a Canadian lawyer or notary public to be valid for authentication at Global Affairs Canada (this includes the CRA Certificate of Residency). If you have already had this done, take a second to make sure that the stamp, seal, and signature of the lawyer or notary public are all present and legible. More importantly, make sure that they match. If Global Affairs Canada cannot clearly read the name of the lawyer or notary public, or if there is a missing element in their notarization then they will not be able to authenticate your document. This is another common cause of delay that can be easily avoided. Once you know you have all the documents you need and have checked to make sure they have all been notarized correctly, you are ready to use our services. Canadian university degrees and other educational documents are another commonly requested type of document for use in Kazakhstan. These are typically requested for matters relating to employment or further studies. Most public Canadian educational documents are signed by an authorized individual whose signature is on file at Global Affairs Canada, such as a principal, vice-principal, dean, or university registrar. This makes these documents valid for authentication in their issued state. Educational documents from private schools or institutions require notarization by a lawyer or notary public to be valid for authentication. There are some cases when these will not be accepted even if they have been notarized. This is especially true in the case of TEFL and TESOL certificates; not all will be accepted for authentication even if they have been notarized. One of our agents can help you verify this. University degrees can also be tricky to process for use overseas but for different reasons. First, many university degrees are issued in sizes larger than a standard sheet or regular or legal sized paper. This makes shipping them very expensive and the likelihood that they will get damaged much higher as they are handled by staff at the embassy. You can save on shipping costs and protect your original degree by making a notarized copy with a lawyer or notary public. However, notarized copies of degrees are not always accepted by requesting parties abroad due to the increased risk that they may not be authentic. You will have to check with your requesting party in Kazakhstan whether a notarized copy of your degree or educational document would suffice. We can do this for you when you use our services and also provide special protective envelopes for all manner of documents for shipping. If you do not currently have your Canadian university degree and need to order another one, you can do so by using the helpful links below. Whether you are an individual or a corporate entity, authentication and legalization can be a pain. For individuals, going through the process can be like briefly taking on a part time job. The amount of planning and preparation involved can be extensive and there is no shortage of stress involved. For many Canadian businesses with active international affairs, authentication and legalization would require its own department and specialized staff to do consistently enough to meet deadlines with minimal delays. The amount of resources wasted on this deceptively simple process would likewise be excessive. Neither of these two scenarios are ideal which is why thousands of Canadians choose the experts every year to assist them. Our proud membership with the Canadian Chamber of Commerce, A+ rating with the BBB, and countless 5-star reviews on Facebook and Google make it clear that we are the best choice when it comes to authentication and legalization. We also proudly hold the title as the most accessible company in our industry, with service centers in Edmonton, Regina, Winnipeg, Toronto, North York, Mississauga, Halifax, Vancouver, Victoria, Surrey, Calgary, or Montreal. These allow our clients to receive free shipping via FedEx to our head office in Ottawa for processing and free shipping via FedEx again upon return to any one of our service centers for pick up. You can receive free shipping as well. All you need to do is contact our office and speak to one of our agents, confirm use of our services, make an appointment and you’re good to go! Your Canadian documents will be ready for use in Kazakhstan before you know. Don’t take the risk, trust the professionals and receive the unparalleled service quality you deserve. Click below to get started now!